Hello. 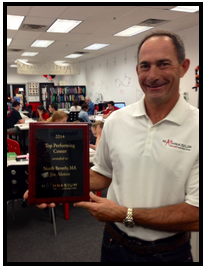 I’m Jim Aloisio, Owner and Center Director of Mathnasium of North Beverly, your neighborhood math-only learning center. We help kids in grades Grade school through Grad school understand math by teaching the way that makes sense to them. We know how to teach your child math. Our specially trained math instructors will teach your child how to understand math in an individual setting – our unique approach enables us to effectively explain math concepts well and lend a helping hand to every student. Our tutors foster a caring, encouraging environment that helps kids thrive and learn! We pinpoint your child’s learning needs, meet them where they are, and take them where they need to go. Mathnasium instructors use our unique assessment process to determine (with great accuracy) exactly what each child knows and what they need to learn. Next, we design a customized learning plan for teaching the concepts the student needs to master. It doesn’t stop there – our encouraging instructors continually check progress along the way to make sure kids truly understand and retain the concepts we’ve taught. The results are transformative – kids will see measurable changes in attitude, confidence, and school progress. We will help your child overcome homework frustration. Our instructors will also set aside time to provide homework help. We help kids understand the homework assignment so they feel better prepared to complete the work at home – underscoring their understanding of concepts and transforming homework frustration into a welcome challenge. At Mathnasium of North Beverly, we specialize in teaching kids math the way that makes sense to them. We only tutor math related topics from 1st grade through college level course, including Pre-Calculus, Trigonmetry, Statistics and Calculus. Using the time-tested, proprietary Mathnasium Method™, we’re committed to helping your child catch up, keep up, and get ahead in math. Your child will receive personalized instruction and a customized learning plan based on their unique needs and goals. The results are measurable progress and confidence in math. Our math tutors provide homework help that addresses gaps in knowledge and teaches proper study skills. Homework will be seen as a welcome challenge and an opportunity for further learning. Set your own schedule! 8, 12 or 16 hour packages to be used between June and September, drop in on the days you choose. Spread out your visits through summer, or complete in just a few weeks. All instruction is 1 to 1 in either a semi private or private setting. to schedule your free trial hour or set up the initial formative evaluation.